All databases have logs associated with them which keep a record of changes to the database. Lets consider IBM DB2 database for understanding the database logging techniques. A database that uses archival logging can be backed up online. To reach a specified point in time, you can perform a rollforward recovery. A database that uses archival logging is therefore also called recoverable.There is another type of logging , Circular logging which keeps all restart data in a ring of log files. It starts logging in first file in the ring, then moves on to the next, and so on, until all the files are full. 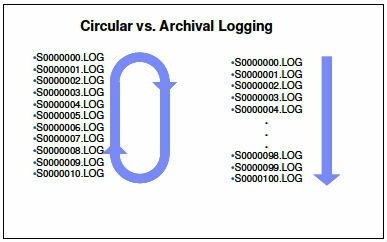 Circular logging overwrites and reuses the first log file after the data it contains has been written to the database. This continues as long as the product is in use, and has the advantage that you never run out of log files. Now suppose a database backup is to be done for which it needs to stopped or taken to an offline mode. However users will continue to make or receive calls. We as mobile users are not aware when our service provider will take a database backup. Hence if circular logging is used , backups lose any incoming data while the backup operation is in progress. The advantage of choosing archive logging is that recovery tools can use both archived logs and active logs to restore a database either to the end of the logs, or to a specific point in time. The advantage of using circular logging is that you never run out of log files or storage space issues. Below is an easy to understand comparison between the two logging methods.